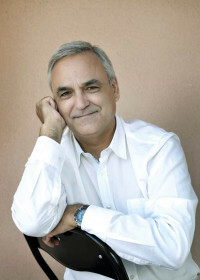 La pèrdua (Loss, 1987), Atles d’aigua (Atlas of Water, 1995) and De les criatures més belles (Of the Most Beautiful Creatures, 2006) which have won him the Salvador Espriu Prize for Young Poets, the Ausiàs March Prize, the Vicent Andrés Estellés Prize, and the Benvingut Oliver Prize, among others. He has also published works in collaboration with other authors, such as the manual Literatura universal (Universal Literature, 1999), and has published biographical essays and art criticism. As a translator, he has published versions of Carson McCullers, Bernardo Atxaga, and Jean Cocteau in Catalan. His own books have also been translated into numerous languages, including Spanish and Galician. Shorter works of his are available in English, French, Italian, Hungarian, Russian, and Chinese. He publishes regularly in the Catalan press.